We have made it to the final week. We arrived safely in Guangzhou yesterday. April and I have been exhausted – we were still trying to get adjusted time wise, the girls have have taken a little getting used to and the busyness of toddling ‘twins’ has made for a combination that has really thrown us for a loop. Graceann has been a champ, she has really stepped up. She has held babies, changed diapers, fed and wiped mouths, been an errand runner, hand holder, etc. It is not an overstatement to say that we don’t know what we would have done without her. There are two families of the 11 with our group that are adopting two children on this trip. 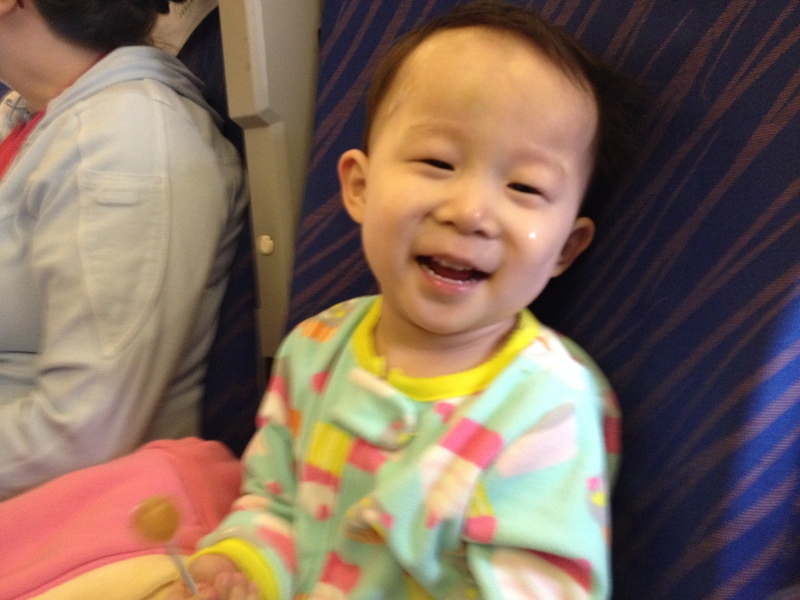 The other family is persevering with their two little ones but they don’t have an additional travel companion – that is where Grace has been such a blessing. 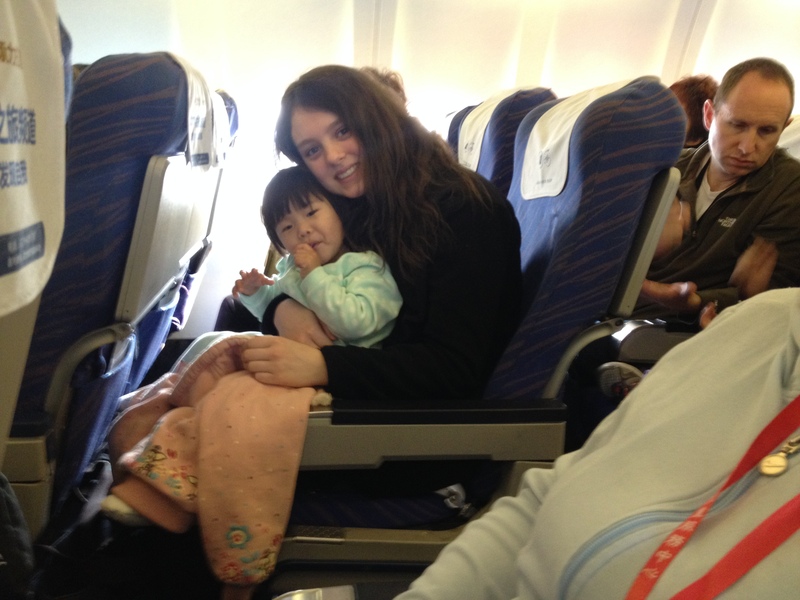 The girls did well on the plane ride from Zhengzhou to Guangzhou. It was about a two hour plane ride. 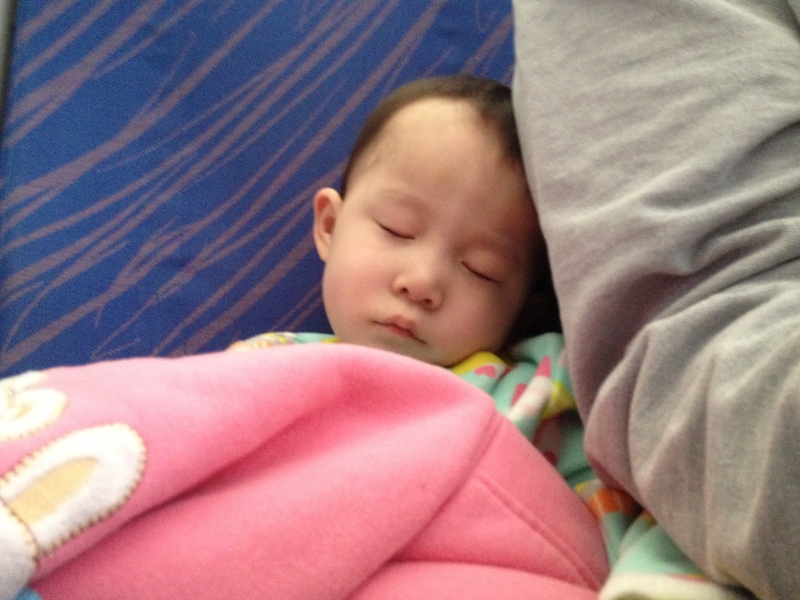 Hope was lively and active in April’s lap and Faith slept most of the way. Hope thought the turbulence was quite funny. Most everyone else on the plane, not so much. Once we got to Guangzhou, we were totally exhausted from the early morning, bus ride to the airport, carting luggage, plane ride, bus ride to the hotel (I dozed) and getting unpacked. They have Papa Johns here so we ordered two large pizzas. $45 later, April and Grace thought it was the best money we’ve spent so far on the trip and I was still smarting for dropping that much money on lukewarm PJ without a 2 for $20 deal. 🙂 Nonetheless, we had the leftovers for lunch today. After the pizza, I took my new travel buddy, Faith, with me to the 7-11 to get a couple of liters of water (the water is not safe for drinking). We got back to the hotel room around 8 pm, gave the littles bottles and put them to bed. We were all asleep by 9:00 pm and didn’t get up until 6:30 am this morning. It was wonderful to get that much sleep, we all feel so much better! The Lord gives His beloved sleep (Psalm 127:2) and we were certainly thankful for a good night’s rest. Today there was an optional tour given to a Buddhist monastery among a couple of other things. I probably wouldn’t tour any kind of monastery for conscience sake on any day but particularly not on the Day that Christ rose from the dead. One of the hardest things apart from being away from our children is being away from the flock that we love so much. To all of our brothers and sisters who are getting ready to begin their Lord’s Day in the states, be thankful for the church of Jesus Christ. We tried to find a place to worship in Guangzhou and the nearest International Fellowship was not within walking distance. If you’re interested, you can read about the restrictions of mainland Chinese to worship with them. We were able to video Skype Christian, Gabe and Micah earlier today. It was a balm to our souls to see their sweet faces and chat with them over the internet. The boys got to see their little sisters for the first time. Christian wrote on Facebook after getting to see them, “Got to talk with one of my new little sisters over Skype. I am not given to an overabundance of emotion, but I must say that I already love these little girls to death. Guess that makes 8 children now under my protection and watch. I don’t say it enough but to Gabe, Jake, Grace, Elijah, Ryle, and Micah, I love all of you so very much. And to my dear little sisters Hope and Faith, welcome to the family.” These are those things that you treasure in your heart as a parent. Tomorrow we go to the medical clinic where the girls will have a quick exam and blood drawn to test for TB. After that we have a little free time until the evening where we’ll be taking a cruise on the Pearl River. We are in the home stretch now. The Lord has been gracious and we have certainly known His help every step of the way. I am so thankful this evening. I have found myself on numerous occasions on this trip having that David moment of wonder in 2 Samuel 7:18, “Who am I, O Lord God? And what is my house that You have brought me this far?” God is good and does good. Much love to all. We particularly miss you RBC knowing that you are getting ready to gather together.